1）Access the Google Play Store or the Apple Store and download the "050 free" app. 2）Once downloaded, insert your user ID and password (find them in the Brastel package) and sign in. you are able to make and receive calls. 1）An "Error" message is displayed and I can not see my balance. → The entered user ID and password may be incorrect. Please, reset your account and sign in again. Q）How can I top up? →You can pay at the convenience store with the card or the payment sheet we have provided you. You can check here how to pay at the convenience store. Q）I have lost my Brastel card. →Since it can be issued again, please contact our customer service. Q）Is there any expiration date for my card balance? →Yes, one year after the last top up or the last paid call made from your user ID. Also, the password and balance will be both invalidated. Q）I can make calls, but not receive them. →Please, confirm that the push up notifications are on. You can do it through the app Settings menu. If the problem persists, contact Brastel Telecom. Q）How much does it cost to make international calls? →You can check it by accessing the "My account" menu inside the app. Then go to "Rates" and type the country you want to call to. 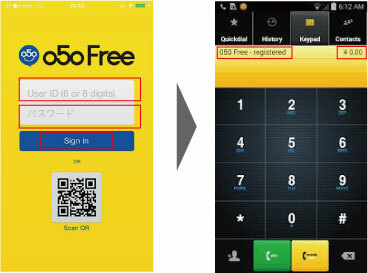 Q)Can I register my 050 number in apps such as LINE or WHATSAPP? will need to register through your Facebook account.